Trade show exhibit includes (10) panel hook-and-loop stand for placing materials! Knockdown counter sets up in minutes with no tools needed. 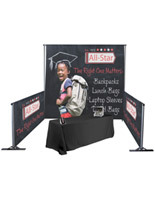 (2) Tall banners make your trade show exhibit stand out in a crowd. Carrying bags included with each component for transporting to & from events. 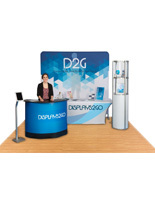 This trade show exhibit features a counter with a portable design that is used for greeting patrons and placement business materials. 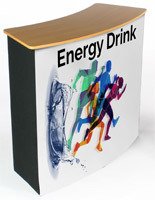 The large MDF counter sits upon a pop-up frame that sets up quickly using magnets, and hook and loop fabric. 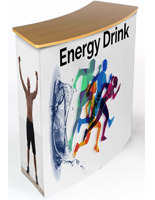 The trade show exhibit has (2) shelves inside the counter for placing drinks or additional promotional materials. The included carrying bag makes bringing this portable counter to and from events simple. 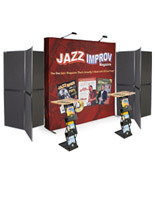 This pop up booth, trade show exhibit also features a hook and loop panel stand. There are (10) total surfaces to place items on such as company posters, literature holders, and sign frames. 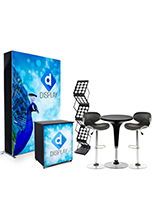 The trade show exhibit ships in two pieces, and can easily be assembled to its full height of 7'. Two carrying bags are included to make transport to and from booths simple. 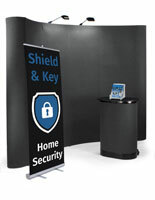 The trade show exhibit also features (2) banner stands for placing alongside the previously mentioned units. These graphic holders are retractable in design. Unlike rental booths with a generic message or design, your custom graphics extend out from a heavy-duty silver casing. The trade show exhibit has feet that fold out for use at exhibitions, and fold alongside the case for transport and storage. These retractable banners are protected from wear and tear while stored within the durable aluminum case. 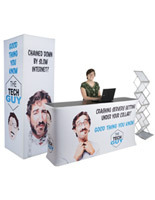 Order these tradeshow displays and pop up booths to help gain attention of potential clients at your next event today. By owning the units, your company will not have to worry about rental fees for displays ever again! 129.0" x 84.0" x 0.875"
37.0" x 90.0" x 13.5"